In November of last year, Chinese Vice President Li Yuanchao visited Kabul to celebrate 60 years of diplomatic relations between Afghanistan and China. The most senior level visit to Kabul by a Chinese official since the now-defenestrated former Politburo member and security minister Zhou Yongkang visited in 2012 the visit showed China’s continuing commitment to Afghanistan, whilst also highlighting its limits. Sitting awkwardly in President Xi Jinping’s ‘Belt and Road’ vision, Afghanistan remains a foreign policy conundrum to China who continues to see the potential risks from the neighbouring country, but that Beijing understands it has a particularly central potential role to play and whose proximity negates a completely detached approach. The result has been a hedging policy in which China continues to show some level of commitment towards Afghanistan whilst not going so far as to taking on the mantle of leadership. This entry was posted in Afghanistan and tagged Afghanistan, Belt and Road, China, China-Afghanistan, OBOR on May 22, 2016 by Raffaello Pantucci. Communication, Co-operation and Challenges: A Roadmap for Sino–Indian Engagement in Afghanistan concludes a research project which brought together influential thinkers and experts from China, India, Pakistan, the UK and Afghanistan in a number of workshops in London, Beijing, New Delhi and Qatar, and outlines areas of common interest between China and India in Afghanistan. The project spanned several years, starting in 2012. While participants’ opinions and responses were therefore likely influenced by developments in Afghanistan at the time the workshops were held it is, however, still possible to draw out the key commonalities and divergences between each country’s participants to map out policy ideas for co-operation and ‘burden-sharing’ between India and China in Afghanistan. Both China and India have unique and strong relationships with Afghanistan and, in addition to co-operative efforts, both countries can play a number of bilateral roles. This paper presents some ideas for thinkers and strategists in Kabul, Beijing and New Delhi on how to help Afghanistan move forward and achieve stability. This entry was posted in Afghanistan, Regional Play and tagged Afghanistan, China-India, China-India-Afghanistan, China-Pakistan on February 10, 2016 by Raffaello Pantucci. China is playing a positive role in Afghanistan, but needs to take a greater ownership and direction of the potential peace process. As a partner with positive relations in both Kabul and Islamabad, Beijing is well placed to play this role. The latest round of the Quadrilateral Group (Afghanistan, China, Pakistan and the USA) is being held in Islamabad this week. This round builds on an effort instigated by Beijing earlier in 2015 and has been one of the hallmarks of Afghan President Ghani’s presidency. The question, however, is whether China has the power to be a decisive player in Afghanistan that it has been increasingly hinting at with its role in these talks. China has long been playing a productive role in the country. Whilst Beijing maintains awkward relations with Washington across the Pacific Ocean, on land, it is undertaking joint training programmes with the United States for Afghan diplomats and officials. It has helped facilitate discussions between Afghanistan and Pakistan and has helped soothe relations between Islamabad and Delhi. Most significant, however, has been the official diplomatic track that it has helped open between the government in Kabul and the Taliban. Though unofficial contacts existed previously, President Ghani’s ascent to power in September 2014 gave the relationship renewed impetus. This included a focus on a key role for China in the Afghan peace process, a point highlighted by Ghani’s first formal overseas trip being to Beijing. This was not the first time discussions between the government in Kabul and the Taliban had been mooted. Previous dialogue tracks through institutes like Pugwash, in Chantilly, France or through the Taliban Doha office had not appeared move very far forwards with little evidence that the Taliban were taking the negotiations seriously. In contrast, the track opened with Beijing’s support appeared to draw its influence directly from the heart of the Taliban in Pakistan. Consequently, there appeared to be greater confidence that those talking were able to deliver what they were discussing. This was a key aspect to make the talks genuinely useful. This entry was posted in Afghanistan, China and tagged Afghanistan, China, China-Afghanistan on February 3, 2016 by Raffaello Pantucci. India’s path to membership of the Shanghai Cooperation Organization (SCO) now seems certain. It is not clear that the Ufa Summit will conclude with the organization admitting both Pakistan and India, but the next step in membership will be taken with Delhi formally being admitted into the SCO structures next year. But what will this new membership actually mean for India? The short answer: not much. An often misunderstood and overblown entity, the SCO was founded in 2001 and evolved from a grouping born out of the end of the Cold War to define China’s western borders. Over time, the grouping discovered a common set of interests in countering terrorism, agreeing broadly on what constitutes terrorist activity and then developed structures to try to counter it collectively. This entry was posted in India and tagged Afghanistan, Afghanistan-Pakistan, China-India, India, India-Afghanistan, India-SCO, SCO on July 16, 2015 by Raffaello Pantucci. A head of state’s first visit abroad is usually a strong indicator of that country’s future foreign policy. So when Ashraf Ghani, the newly elected President of Afghanistan chose China as the destination of his first state visit, the message from the new President of Afghanistan was clear: as we enter the year of NATO withdrawal, Afghanistan is increasingly looking East. President Ghani certainly received a warm welcome in Beijing; President Xi Jinping showed China’s generosity promising a $330 million aid package over the next 3 years, a figure that exceeds China’s combined aid to Afghanistan for the last 14 years. China also announced a plan to help to train 3,000 Afghans in various fields, something that builds on previous promises of training, including an earlier program announced during former Politburo member Zhou Yongkang’s visit to Kabul in 2012 of 300 Afghan police. The discussion of re-opening the Wakhan Corridor, the slim mountainous borderland between Afghanistan and China that has long been a request of the Afghan government, has been restarted. Visa requirements for government officials of both countries are said to possibly be about to be scrapped. But in many ways, the most interesting outcome of Ghani’s visit to China was the revelation that China would offer itself as a host for peace discussions between the Taliban and the government in Kabul – bringing all relevant sides to the table to help broker peace in the country. Whether this approach will bear fruit is unclear, but its seeming admission and confirmation by officials highlights the fact that China is proving itself increasingly willing to accept it has an important role to play in Afghanistan’s future. This entry was posted in Afghanistan, China and tagged Afghanistan, China, China-Afghanistan on June 14, 2015 by Raffaello Pantucci. Will China Bring Peace to Afghanistan? After years of fence-sitting, Beijing appears to have finally decided to admit that it is willing to play a role in Afghanistan’s future. While the exact contours of the part it seeks to play are still uncertain, China’s willingness to be seen to be involved in brokering peace in Afghanistan is surprising for a nation that continues to profess non-interference in other countries’ internal affairs as the core of its foreign-policy credo. It also remains unclear exactly how China can help to bring the Taliban to the peace table: while it may have the links to both the government in Kabul and the Taliban, it is uncertain that it knows how to bring them together, beyond offering a platform for talks. This activism is nonetheless likely to be welcomed by Western powers. Yet high expectations are not warranted; even if China does ultimately prove that it knows what to do with these talks, its efforts in Afghanistan will ultimately seek to advance its own interests rather than those of the West. This entry was posted in Afghanistan, China, Publications and tagged Afghanistan, China, China-Afghanistan, China-Pakistan, China-Taliban, Taliban on March 8, 2015 by Raffaello Pantucci. 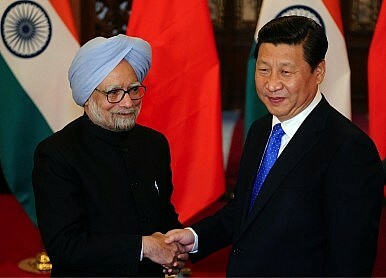 Sino-Indian Relations: Competition or Co-operation in Central Asia? Central Asia is emerging as a region that could test the influence of India and China. Although New Delhi is following Beijing’s lead and expanding into this resource-rich and strategically important region, it is set to play second fiddle. This entry was posted in Central Asia, China, India, Regional Play and tagged Afghanistan, Central Asia, China, energy geopolitics, India, New Silk Road, SCO, strategic partnership, Xinjiang on December 11, 2014 by Sarah Lain. This entry was posted in Afghanistan, China and tagged Afghanistan, Amu Darya, Aynak, China, China-Afghanistan, CNPC, SCO, Xinjiang on June 2, 2014 by Raffaello Pantucci. Characterised by soaring rhetoric, at first glance the China–Pakistan bilateral relationship appears to be one of the world’s closest. Yet below the surface calm bubble concerns, with policy-makers in Beijing particularly worried about the implications of the 2014 withdrawal from Afghanistan for stability in Pakistan. Western policy-makers should not, however, be optimistic that these concerns will soon translate into Chinese willingness to somehow assume responsibility or leadership in helping Pakistan to develop in a way favourable to the West. Rather, Chinese concerns should be seen within the context of a regional relationship that is likely to grow in prominence as time goes on, ultimately drawing China into a more responsible role in South Asia at least. This entry was posted in Afghanistan, Regional Play and tagged Afghanistan, China, Pakistan on March 29, 2014 by Raffaello Pantucci. This entry was posted in Afghanistan, China and tagged Afghanistan, Central Asia, China, China-Afghanistan, India on November 15, 2013 by Raffaello Pantucci. Alexandros Petersen discusses China’s ‘inadvertent empire’ in Eurasia at the Jamestown Foundation’s conference: U.S. Relations with Central Asia After 2014 and the New Silk Road. Video available here. This entry was posted in Publications and tagged Afghanistan, China Eurasia Expo, Inadvertent Empire, New Silk Road, SCO, Turkmenistan, Uzbekistan, Xinjiang on November 5, 2013 by China in Central Asia. Central Asia’s beating heart, the commercial hub of the region that cultivated the old Silk Road, is neither of the fabled Thousand and One Nights cities of Samarkand or Bukhara. In fact, the center of this region is not even really in Central Asia. It’s in China. This entry was posted in Afghanistan, Central Asia, China, Dispatches From The Road, Publications and tagged Afghanistan, China Eurasia Expo, GDP, New Silk Road, Shenzhen, trade, Turkic, Uighur, Urumqi, Xinjiang, Zhungarian on July 15, 2013 by China in Central Asia.